Who wouldn’t want a kitchen customized to meet their particular tastes and needs? A complete kitchen renovation can cost tens of thousands of dollars, but you don’t have to spend a bundle to achieve a custom effect. A few modest investments can help make your kitchen work well and look great. * Replace dated or dull hardware with drawer pulls and knobs that speak to your design tastes. For example, if you love a vintage look, replace metal hardware with glass or ceramic knobs. Cabinet hardware isn’t the only “jewelry” in the kitchen. The faucet can also be a design focal point that looks as good as it works. If yours is old, basic or just not to your taste, replacing the kitchen faucet with a newer model that speaks to your style can help reinvent the entire room. 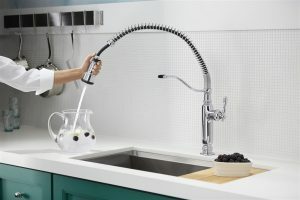 Plus, a new faucet can provide functions and features that will make your kitchen more usable. If a more vintage look appeals to you, Kohler has recently added a bridge model faucet to its favorite Artifacts line. Reminiscent of turn-of-the-century kitchen and bar faucets, the deck-mounted bridge faucet works with either lever or six-prong handles for temperature controls and features a dual-function side spray. Visit www.us.kohler.com to learn more. Good light is essential for a kitchen to function well, but it’s common for kitchens to have just one overhead light and maybe a pendant or two over a breakfast bar. Replacing dated fixtures with newer ones that suit your style is easy, but what can you do if you want more light without the expense of paying someone to install additional wiring? * Replace a standard ceiling light with track lights. They require no additional wiring, and you can position lights along the track to put illumination where you want it. * A matching set of pot holders or dish towels hung from a hook beneath a cabinet or on the side of a cupboard not only puts a much-needed item close at hand, but they can also add decorative flair. * Place a bright, cheerful area rug in front of the sink or prep area. The rug will not only perk up space but helps cushion your joints while you stand in one spot working. * A pot rack above an island provides much-needed storage space for large pots and pans while adding a homey touch to the kitchen.